A test bench for the test of ABS devices is created. It simulates a breaking process in order to check the functional ability of the control device. One of the important facts to be found out is which force is achieved at which point of the pedal travel. The acquired data is to be compared with set point values. A simple path control (pedal travel) is not sufficient for this task: At the beginning the pedal travel is very long, at the final stage the effected pressure is very strong. Reference values for the force/distance relation are predefined. In order to be able to receive a consistent data set of force and distance values, the force and distance measurement is started synchronously. 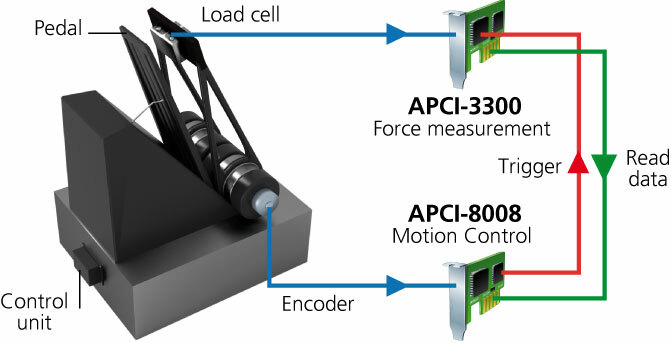 For this, the intelligent PCI motion control board APCI-8008 triggers the PCI pressure measurement board APCI-3300 and reads out its values directly through the PCI bus thanks to its bus master ability. Thus the APCI-8008 takes load off the computer CPU. If the measurement values exceed the tolerance limit the measured pieces go to rework.